Watercolour of the Qutb Minar in Delhi, by Latif, an artist working in the Agra style, part of the Bax Collection, c. 1820-22. 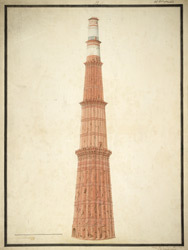 Inscribed on the front in English ... 'at Delhi'; in Persian characters: 'Lath i Qutb Sahib dar shahr i Dihli 'amal i Latif' (Pillar of Qutb Sahib at the city of Delhi. The work of Latif). One of the greatest monuments of Islamic architecture in India, the Qutb Minar forms part of the Quwwat al-Islam or 'Might of Islam' complex in Mehrauli in the southern suburbs of modern Delhi. The complex contains some of the earliest structures of Muslim rule in the sub-continent. Standing 72.5 metres tall, the minaret was built as a celebratory victory tower to accompany the congregational mosque. It was probably inspired in style by contemporary Afghan minarets. Inscriptions record that it was begun by Qutub-u'd-din Aibak in 1198 and completed by his successor Iltutmish in 1215, although the two upper tiers were rebuilt at later dates. The dominant material used in construction is sandstone. Four cantilevered balconies separate its five sections. The lower three storeys have broad carved bands of interwoven calligraphy and floral motifs.